ELK POINT, SD — A 12-member jury and four alternates, including 11 women and five men, are ready to hear opening arguments today in a $1.9 billion defamation trial scheduled to last eight weeks here at the Union County Court House. 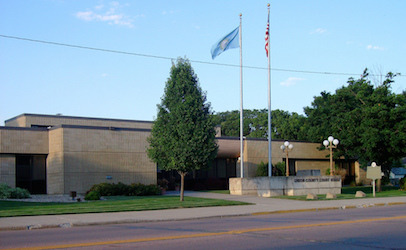 Union County Courthouse in Elk Point, SD, is the location of the trial pitting Beef Products Inc. against ABC News. A community room in the basement of the courthouse had to be renovated into a new courtroom at a cost of about $100,000 because the other two courtrooms in the building were deemed to be too small to handle the trial. Five years in the making, the trial pits a locally based niche beef processor against one of the nation’s major television networks and a reporter who has been making TV news since the O.J. Simpson trial. At issue is whether the the network and its reporter violated South Dakota’s Agriculture Food Product Disparagement Act. If it did, any award won at trial could be tripled under the Act — to as much as $5.7 billion in this case. The jury will have to decide if the network and its reporter defamed the product known within the meat industry as lean finely textured beef by repeatedly referring to it as “pink slime” in numerous reports beginning in March 7, 2012. Those reports continued over the next month when, BPI claims, ABC aired and published nearly 200 false statements about the meat company and its product in 11 news broadcasts and 14 publications. BPI and the associated companies are owned by Eldon Roth and his family and are headquartered at Dakota Dunes, SD, at the confluence of the Big Sioux and Missouri Rivers. A year before it was confronted by the “pink slime” crisis, BPI lean finely textured beef product was contained in as much as 75 percent of the ground beef sold in the U.S. But after the “pink slime” reports on ABC News, major grocery stores and fast food outlets ceased purchasing the product and by May 25, 2012, BPI had to close three of its four plants, and lay off at least 650 workers. Initially named as defendants were the American Broadcasting Company, ABC News, Diane Sawyer, Jim Avila, David Kerley, who together were referred to as the “ABC Defendants” plus three “interviewees” — Gerald Zirnstein, Carl Custer, and Kit Foshee. The American Broadcasting Company is owned by the Disney–ABC Television Group, a subsidiary of the Disney Media Networks division of The Walt Disney Co. Disney is one of six corporations said to own or control 90 percent of the media in the U.S.
ABC World News journalists Diane Sawyer and David Kerley were dismissed as defendants in the case, as were Zirnstein, Custer and Foshee, who offered information and opinions about BPI’s product during interviews with the news organization. Cheryle Gering is the trial judge. She was appointed as a judge of the First Judicial Circuit in South Dakota in April 2011 by South Dakota Governor Dennis Daugaard, a Republican, to fill out the term of a retiring jurist. She won election on her own in 2014 to a term ending in 2022. Prior to being named to the bench, Judge Gering was an attorney at Davenport, Evans, Hurwitz & Smith in Sioux Falls. She received her undergraduate degree from the University of South Dakota in 1988. She went on to earn her J.D. from the University of Iowa in 1991, graduating 6th in her class. During her oversight of the BPI v. ABC case during the past five years, her rulings have largely passed muster as they’ve come under review by both the South Dakota Supreme Court and the U.S. District Court for South Dakota While she has had to speculate on what a jury might decide under various circumstances, she has not ruled on the merits of the case. BPI is represented by Chicago’s oldest law firm, Winston & Strawn. It maintains 17 offices around the world with about 850 lawyers. Chicago partners Dan Webb, Erik Connolly, Nicole Wrigley, and Terry Grimm are among the attorneys representing BPI. The “first chair” for BPI this morning is expected to be filled by Webb, former U.S. Attorney for the Northern District of Illinois who joined Winston & Strawn in 1985. He has tried more than 100 jury cases with several lasting two months or longer. ABC News and on-air reporter Jim Avila are represented by Williams & Connolly, the Washington D.C.-based law firm founded by legendary trial lawyer Edward Bennett Williams and his former student, Paul Connolly. The firm is recognized for many firsts, including paying the highest starting salaries of any law firm in the country. ABC’s “first chair” this morning is expected to be filled by Kevin T. Baine, co-chair of Williams & Connolly’s First Amendment practice group, an attorney known for representing major media, universities, churches and nonprofits involving freedom of speech, the press and religion. Dane H. Butswinkas, Carl R. Metz, and Stephen J. Fuzesi are among the other Williams & Connolly attorneys who are active on the defense team. Editors Note: Attorney Bill Marler, publisher of Food Safety News, represented retired USDA scientists Gerald Zirnstein and Carl Custer until they were dismissed as defendants in this case. Writer/editor Dan Flynn was served with a subpoena from the plaintiffs during early stages of this litigation but was not required to provide any information or to testify. That subpoena is now thought to be inactive.